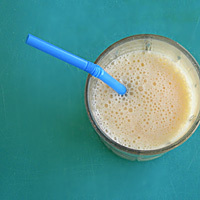 Is it just me, or does it just hurt to spend $4 on a little smoothie drink at Orange Julius? I'm still paying it, of course. I go through long periods of intense orange juice cravings, so me and that pit stop are pretty much magnetized when I'm at the mall. However, that orange juice pusher is nothing to me these days. 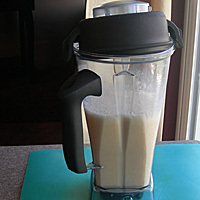 I've got my own blender, after all. 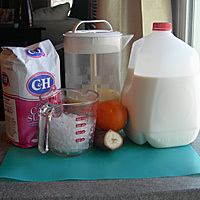 There are tons of recipes out there for an orange julius, but the main problem with them is that they don't taste like the real thing. At all. 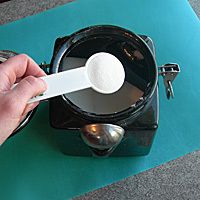 This one is great, and I think the trick is not to add too much ice. Think of it as one step below smoothie thickness. And, of course, lots of froth is key. Assemble your ingredients Love that sugar. Blend everything together. 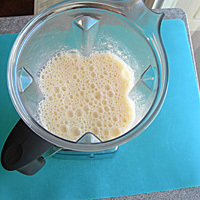 The milk makes it frothy, so blend it well. Taste and add more ice as needed. Serve cold. Problems: The only adjustment I make is with the ice. It makes it taste really different if you add too much or too little.